Obesity is one of the biggest challenges facing the developed world, so people are very aware about what they eat. Chocolate has always been labelled as one of the foods to avoid if you are intent on losing weight. However, chemicals found in dark chocolate – such as flavanoids and phenethylamine – are known to have positive effects on humans’ health and wellbeing. In addition, only one third of the fat in dark chocolate contributes to LDL cholesterol levels. In our calorie conscious world today, chocolate has consistently garnered a bad reputation. From causing acne to obesity, the cocoa candy has been known to be loaded with fats and sugars; however, research has highlighted some surprising health benefits associated with the consumption of chocolate. Chocolate specifically contains a compound called flavanol, a type of flavonoid, which is a compound generally found in vegetables, fruits, teas, and wines that exhibit anti-aging and antioxidant behavior.1)Buhler DR, Cristobal M. “Antioxidant Activities of Flavonoids.” Linus Pauling Institute at Oregon State University. Nov. 2000. The Linus Pauling Institute. Available from: http://lpi.oregonstate.edu/mic/dietary-factors/phytochemicals/flavonoids. [Last accessed on 2011 Jun 20]. Flavanol gives the chocolate its sharp flavor and lends its antioxidant powers to prevent oxygen radicals and environmental toxins from damaging the body.2)Buhler DR, Cristobal M. “Antioxidant Activities of Flavonoids.” Linus Pauling Institute at Oregon State University. Nov. 2000. The Linus Pauling Institute. Available from: http://lpi.oregonstate.edu/mic/dietary-factors/phytochemicals/flavonoids. [Last accessed on 2011 Jun 20]. Increased amounts of oxygen radicals in the body have links to various diseases such as cancer and atherosclerosis,3)Rettner R. “Sweet Science: The Health Benefits of Chocolate | LiveScience.” Current News on Space, Animals, Technology, Health, Environment, Culture and History | LiveScience. 11 Feb. 2010. TechMediaNetwork.com. Available from: https://www.livescience.com/6111-sweet-science-health-benefits-chocolate.html. [Last accessed on 2011 Jun 20]. the condition in which fatty substances such as cholesterol block the blood vessels and thicken the artery wall. These substances in chocolate prevent the buildup of low-density lipoprotein (LDL), known as the bad lipoprotein, which reduces the risk of artery plaques and blood clots and improves the blood circulation. Consequently, these substances also lower blood pressure, a big contributor to heart disease and stroke, kidney problems, and cognitive dementia. Moreover, chocolate also contains many mood-boosting substances such as phenethylamine [Figure 1], which increases the production of endorphins and dopamine.4)Robbins J. “Chocolate’s Startling Health Benefits.” Breaking News and Opinion on The Huffington Post. 22 Feb. 2011. TheHuffingtonPost.com, Inc. Available from: http://www.huffingtonpost.com/john-robbins/chocolates-startling-heal_b_825978.html. [Last accessed on 2011 Jun 20]. These two products are neurotransmitters associated with pleasure and love, the common feelings that people express when eating chocolate. 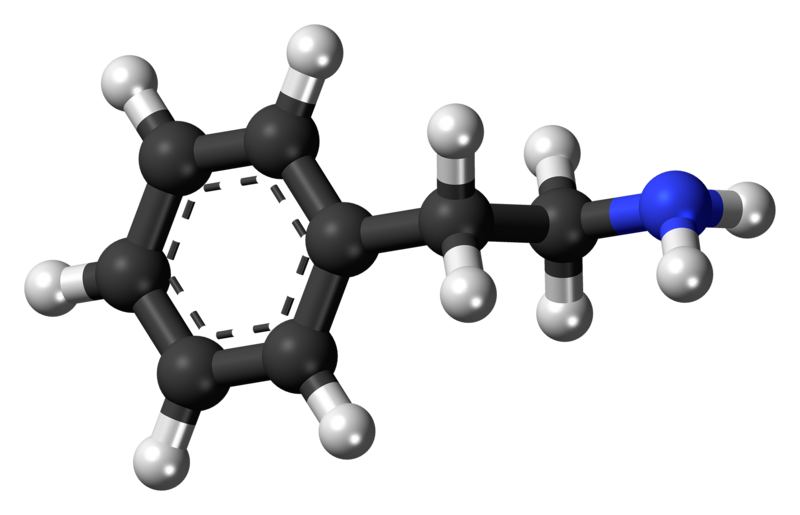 Another substance found is serotonin,5)Robbins J. “Chocolate’s Startling Health Benefits.” Breaking News and Opinion on The Huffington Post. 22 Feb. 2011. TheHuffingtonPost.com, Inc. Available from: http://www.huffingtonpost.com/john-robbins/chocolates-startling-heal_b_825978.html. [Last accessed on 2011 Jun 20]. a neurotransmitter linked to happiness and well-being and a common combater of depression. Also found in chocolate are anadamide and theobromine, which are also transmitters secreted by the brain that help in boosting pleasure and motivation.6)Robbins J. “Chocolate’s Startling Health Benefits.” Breaking News and Opinion on The Huffington Post. 22 Feb. 2011. TheHuffingtonPost.com, Inc. Available from: http://www.huffingtonpost.com/john-robbins/chocolates-startling-heal_b_825978.html. [Last accessed on 2011 Jun 20]. It is no wonder why chocolate has long been used by humans to enhance mood and feeling [Figure 1]. Though many sceptics believe that chocolate contains a high percentage of fat, negating its benefits, it might not be as bad as people think. 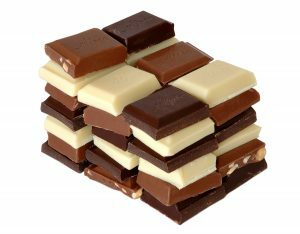 Chocolate comprises equally three main fats: oleic acid, stearic acid, and palmitic acid.7)Cleveland Clinic. “Heart-Health Benefits of Chocolate Unveiled.” Cleveland Clinic. Feb. 2010. Available from: http://my.clevelandclinic.org/heart/prevention/nutrition/chocolate.aspx. [Last accessed on 2011 Jun 20]. Oleic acid is an unsaturated fat that does not elevate LDL cholesterol levels, and though stearic acid is a saturated fat- which normally contributes to LDL cholesterol- research has shown that stearic acid usually is converted to oleic acid, having no significant effect on LDL cholesterol.8)Stibich M. “Chocolate – Health Benefits of Chocolate.” Longevity, Anti-Aging and You – Healthy Aging, Longevity, and Anti Aging. 26 Apr. 2009. About.com. Accessed from: http://longevity.about.com/od/lifelongnutrition/p/chocolate.htm. [Last accessed on 2011 Jun 20]. Thus, palmitic acid is the only truly detrimental saturated fat that raises LDL cholesterol in chocolate and only onethird of chocolate’s fat is harmful to health.9)Stibich M. “Chocolate – Health Benefits of Chocolate.” Longevity, Anti-Aging and You – Healthy Aging, Longevity, and Anti Aging. 26 Apr. 2009. About.com. Accessed from: http://longevity.about.com/od/lifelongnutrition/p/chocolate.htm. [Last accessed on 2011 Jun 20]. However, though there are many benefits to eating chocolate, the main culprit for its bad reputation is its added sugars, which curb its nutritional worth. Furthermore, during chocolate processing, much of the bitter flavonoids from cocoa disappear, leaving chocolate with a greater percentage of sugar and calories.10)Cleveland Clinic. “Heart-Health Benefits of Chocolate Unveiled.” Cleveland Clinic. Feb. 2010. Available from: http://my.clevelandclinic.org/heart/prevention/nutrition/chocolate.aspx. [Last accessed on 2011 Jun 20]. However, different types of chocolate [Figure 2] have different amounts of flavonoids. For example, dark chocolate tends to have a greater supply of antioxidant-rich flavonoids and a lesser supply of sugar, while white chocolate has no cocoa solids and thus no flavonoids.11)Robbins J. “Chocolate’s Startling Health Benefits.” Breaking News and Opinion on The Huffington Post. 22 Feb. 2011. TheHuffingtonPost.com, Inc. Available from: http://www.huffingtonpost.com/john-robbins/chocolates-startling-heal_b_825978.html. [Last accessed on 2011 Jun 20]. Rather, this misnomer comprises cocoa butter, sugar, milk solids, and salt – a concoction void of nutritional content. Thus, moderate consumption of dark chocolate provides the best balance of taste and nutrition. 1, 2. ↑ Buhler DR, Cristobal M. “Antioxidant Activities of Flavonoids.” Linus Pauling Institute at Oregon State University. Nov. 2000. The Linus Pauling Institute. Available from: http://lpi.oregonstate.edu/mic/dietary-factors/phytochemicals/flavonoids. [Last accessed on 2011 Jun 20]. 3. ↑ Rettner R. “Sweet Science: The Health Benefits of Chocolate | LiveScience.” Current News on Space, Animals, Technology, Health, Environment, Culture and History | LiveScience. 11 Feb. 2010. TechMediaNetwork.com. Available from: https://www.livescience.com/6111-sweet-science-health-benefits-chocolate.html. [Last accessed on 2011 Jun 20]. 4, 5, 6, 11. ↑ Robbins J. “Chocolate’s Startling Health Benefits.” Breaking News and Opinion on The Huffington Post. 22 Feb. 2011. TheHuffingtonPost.com, Inc. Available from: http://www.huffingtonpost.com/john-robbins/chocolates-startling-heal_b_825978.html. [Last accessed on 2011 Jun 20]. 7, 10. ↑ Cleveland Clinic. “Heart-Health Benefits of Chocolate Unveiled.” Cleveland Clinic. Feb. 2010. Available from: http://my.clevelandclinic.org/heart/prevention/nutrition/chocolate.aspx. [Last accessed on 2011 Jun 20]. 8, 9. ↑ Stibich M. “Chocolate – Health Benefits of Chocolate.” Longevity, Anti-Aging and You – Healthy Aging, Longevity, and Anti Aging. 26 Apr. 2009. About.com. Accessed from: http://longevity.about.com/od/lifelongnutrition/p/chocolate.htm. [Last accessed on 2011 Jun 20].